Home is where the heart is – And in Portugal, my heart lies at Home Lisbon Hostel. I have stayed in hundreds of hostels, guesthouses, bed and breakfasts and hotels all around the world. I’ve camped and Couchsurfed, lived in a van and slept on the fairways of golf courses. I’ve been lucky enough to experience life inside 5 star resorts and spent weeks sailing the Caribbean in a private catamaran. Passed out on beaches and woken up on stranger’s floors. It takes a lot to impress me when it comes to accommodation. From the moment I walked up the stairs of Home Lisbon Hostel I felt something different. Maybe it was the excitement of being in Portugal, a country I had always wanted to visit, but had no idea why. Perhaps it was the sunny weather and friendly locals that greeted me as I got off the Metro from the airport. However I think it was the staff member Barbara’s broad smile and genuine, “Welcome home!” as I first entered the reception area, bleary-eyed from my flight that made me realise I had stumbled upon somewhere beautiful. Home Lisbon Hostel is one of the best hostels I have ever come across, and it has the awards to show it. I had heard about some of the best hostels in Prague, Berlin, Amsterdam and Budapest, but this one seemed to be different. For two years running it has been voted Hostel World’s ‘Best Medium Hostel’ on the whole planet. Naturally it has Trip Advisor’s ‘Certificate Of Excellence’ to go along with this. They really make it pretty easy to travel Europe cheaply, just by hanging out there. Unlike a lot of places that tend to go downhill once they receive recognition, growing off their positive history rather than maintaining a reputation, Home Lisbon Hostel strives to improve day after day, year after year. From the daily beach tours, surfing lessons and pub crawls to the famous dinners hosted by Mamma, the actual mother of the owner of the hostel, you will find yourself changing your travel plans and staying for a lot longer than anticipated. Located in the centre of the historical district of Baixa, you are walking distance to some of the best things to do in Lisbon such as Saint George’s Castle (Castelo de Sao Jorge), the picturesque neighbourhood of Alfama, the city’s oldest building, The Cathedral, Arco da Rua Augusta and the tram system that takes you directly to Jeronimos Monastery and the Towel of Belem. The surrounding area is a short stroll from the best nightlife in the city but just far enough away to make sure you feel safe when walking around the hostel at night. Cheap cafes and restaurants are located all around Home Lisbon Hostel making sure you will never have to venture too far to fulfil your appetite. The Baixa/Chiado Metro that will get you to the airport, bus or train stations is five minutes walk away. A short walk from the hostel will give you this amazing view! Barbara, Joao, Francisco, Diana, the twins, Joao and Andre Franco and the housekeepers are always on hand to make sure you never feel lost, out of place or stuck for things to do. They know Lisbon as well as they know their hostel and take great pride in ensuring every guest feels completely at home. No request is too hard to handle and after spending only a few minutes with any of them, you feel like you have made a friend for life. These guys are the real reason Home Lisbon Hostel is as special as it is, and they deserve all the credit that the accommodation has received over the last few years. Jazza with Mamma and the amazing staff members. Looking to learn how to surf? Tour out to some of the UNESCO World Heritage Site’s in town? Want to spend a day at the beach? Walking tour of the funky neighbourhoods close by? Heard all about Portugal’s crazy nightlife? Home Lisbon Hostel has you covered! Everyday there is a different activity organised to ensure that your days will be filled with fun, excitement and adventure. The local guides are all experienced in making sure you will have the best possible time no matter whatever you end up doing! Cabo Da Roca is one of the places Home Lisbon Hostel will take you for a day trip. Home Lisbon Hostel is kept spotless! The bathrooms are cleaned four times a day. All the rooms are tidied, swept and dusted daily. The kitchen, even though it is a typical ‘clean as you go’ styled facility, is still wiped over by the professional housekeepers throughout the day. The dorm beds are all sturdy timber designs that don’t shake and rattle whenever you roll over. Each has its own powerpoint and secure locker. Ladies only dorms have hair dryers to use, and every room has its own air conditioning unit. The showers are hot with high water pressure. To make you feel completely comfortable there is a spacious common area with a big screen TV, gaming system and a huge selection of DVD and digital movies. iPads are available to use the lightning fast Wi-Fi for free along with two Apple desktop computers for those who don’t have their own ways of connecting. The bar/reception is open 24 hours a day (and even serves alcohol 24 hours a day, if that’s your thing). A fully stocked kitchen is there for guests to use, except for in the morning – that’s when your free breakfast is provided for you, including eggs, toast, pastries, fruit, cereal, tea and coffee! 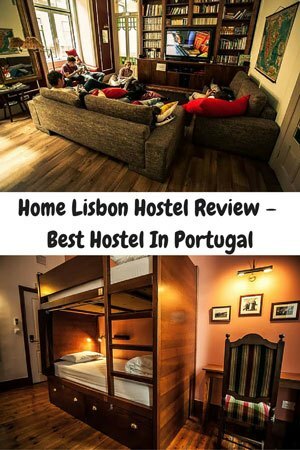 But what makes Home Lisbon Hostel one of the best hostels in the city? Mamma. Every single night Mamma cooks up a home cooked meal for her guests. This is a three course dinner including an entree, main meal and dessert. To wash it all down free beer or wine is provided though out the entire dinner! Every night is a different option and there is nothing like a home cooked meal when you’ve been on the road for a long time! Almost everyone who stays at Home Lisbon Hostel gets involved and it is a great way to meet your fellow travellers. Mamma is the heart and soul of the hostel and her dinner alone is worth staying at Home for! The majority of the guests stick around at night to sample Mamma’s delicious home cooked meals! Mamma preparing dessert for her guests. If you are ever visiting Lisbon and are looking for a place to stay, we highly recommend Home Lisbon Hostel. You will not be disappointed! This review for Home Lisbon Hostel by NOMADasaurus is completely unbiased. I was not offered free accommodation or any other rewards in exchange for this post. I was simply lucky enough to experience what I consider to be one of the best hostels I have ever stayed in. The opinions expressed are entirely those of Jarryd Salem. This home lisbon hostel is fantastic. This post is really nice and useful. Great detailed review! I love Portugal but I still have so many of their luxury hostels to test out! I’ve linked to your review on my site on a database I have for hostel reviews by bloggers 🙂 Thanks for sharing! The place looks fantastic and would certainly suit Franca and I as we love great design hostels (as you know). Plus, having that incredible view and blue water a short walk away is a huge bonus. Definitely worth checking out if you guys end up in Lisbon! One of my favourite places.